The only proven case of poisoned Halloween candy killing a child occurred in Pasadena, Texas, in 1974. But it was Timothy O’Bryan’s father, not a stranger, who put cyanide in the 8-year-old’s Pixy Stix. Ronald Clark O’Bryan, sometimes dubbed the “Candy Man” and the “Man Who Killed Halloween,” was sentenced to death for his crime and executed by lethal injection in 1984. Reported incidents are normally hoaxes. “Typically this is done by the kids,” Best said. Today it’s easy to stick something in your candy, whip out your phone, snap a picture and get it out on social media,” he explained. Of course, there’s no harm in checking the candy. At the very least, it’s a great excuse to sample the goods. And for many Americans, it’s is a lot harder to swallow the idea that strangers aren’t poisoning random children than stories that they are. Myth No. 2: Open season on black cats. If you believe what you see on social media, Halloween is like The Purge for black cats. The fear that people are adopting black cats to torture or sacrifice around the holiday is so great that some animal shelters won’t allow the adoption of black cats as Halloween approaches. For example, the Animal Welfare League outside Chicago places all black cats and black rabbits in a separate room about a week before Halloween and doesn’t return them until two days after, explained the league’s president and executive director Linda Estrada. She concedes that animals, especially cats, are at risk of abuse all year, but puts away the black cats and rabbits at Halloween “just to be on the safe side. We don't want to see even one animal fall into bad hands,” she added. She claimed that one year, a black cat was brought into the clinic the day after Halloween with initials burned onto its flesh. Concerns about the ritualistic torture of animals around Halloween were more widespread in the 1980s and 90s when fears of secret Satanic cults were at their zenith. Many shelters have since abandoned the policy of hiding black cats around Halloween, but according to the ASCPA, “There is no reason to believe that these cats are at risk. While it is true that animals too often become the victims of holiday pranks and cruelty, there is no reason to believe that witches are involved, or that shelters are a source.” The group suggests shelters follow normal adoption procedures at Halloween. “Continued publicity on this tends to make adoption counseling procedures look arbitrary and silly,” the ASPCA contends. Myth No. 4: It’s all about pumpkins. It’s hard to imagine Halloween without carving pumpkins to make jack-o’-lanterns. But the original jack-o’-lanterns were carved from turnips and carried a candle to represent a soul trapped in purgatory, according to Rogers. People in England would sometimes carry the turnips while “souling,” a ritual that included people going door-to-door to ask for food in exchange for prayers for the dead,” he added. One popular story behind the origin of the jack-o’-lantern stems from an Irish myth about “Stingy Jack” who conned the devil in a bar bet. Having angered both God and Satan with his antics, Jack was not welcomed in heaven or hell and was forced to walk the earth with only a burning lump of coal in a carved-out turnip to guide him. In 1996, Sleepy Hollow, New York, changed its name from North Tarrytown to rebrand itself as a spooky tourist destination after General Motors closed its Hudson River plant. Halloween is the town’s peak season. According to Fodor’s travel guide, “There’s no better place to celebrate the holiday than Sleepy Hollow.” But there’s a problem: The Legend of Sleepy Hollow had nothing to do with Halloween. According to Kelly, nowhere in the story is Halloween mentioned and in fact, the holiday wasn’t widely known or celebrated in America when Irving penned his tale. 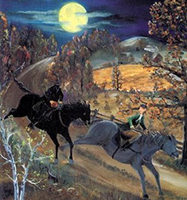 Nonetheless, Brian Jay Jones, author of Washington Irving: An American Original, insists it’s a quintessentially Halloween story, all the same. “If Irving didn’t invent Halloween, then he should have,” Jones said, adding that Irving blended German and Dutch folklore to craft “the first real American horror story.” While Irving may not have explicitly had Halloween in mind when he wrote Sleepy Hollow, the story is set in autumn and “feels like a Halloween story” because it is packed with the sights, sounds and tastes of the season, Jones explained. Source: William Cummings, USA Today, October 18, 2017. I know a lot of people to this day that believe Halloween is an evil, diabolic holiday, and while I understand that it is fine if you do not wish to participate in dressing up or decorating, it's not right to shame or insult people who do enjoy dressing up, labeling them as Satan worshipers. Some of these people won't even allow Halloween candy in the office, or any sort of decor which could actually be considered fall decor too -- like a pumpkin. We had someone like that in my office. She would get upset when I'd dress up for Halloween too, even though my costumes were harmless and not gory or gross in any way. She would not even allow her little daughter to dress up and trick-or-treat! She asked our office manager to ban the practice of dressing up. He made me remove some of my Halloween decor but didn't tell me I could not have candy in my bowl or dress up. I have never understood why some people are so offended by this, a lot of very religious people have no issue with Halloween, for example, and will even participate in dressing up. I asked what religion she practiced and she just said "Christian" but like I said, I know plenty of Christians, Catholics included, that have no issue with the holiday and see it as a fun time to don a costume. There are hospitals that offer to x-ray the candy that kids bring home from trick-or-treating so see if there are any razor blades, pins and other metal objects in it. It's hard to believe that there are people around who are afraid of something as harmless as Halloween candy. It's good to be cautious, but this is just going too far. I agree. While I wouldn't eat any homemade candy, cookies or anything like that from a stranger (some of them give candied apples, for example), or a candy that is missing its wrapper, anything that is still in its wrapper is safe to consume.